There are many solar energy contractors in Napa who want you to believe that the bottom line in solar energy is about nothing but cost. You may believe differently, however, when a cheap “twenty-year” installation does not perform as expected and the business is nowhere to be found! So go with Solaron in Napa for solar panels and heating installations respected for their quality and backed by the reviews of thousands of satisfied clients. 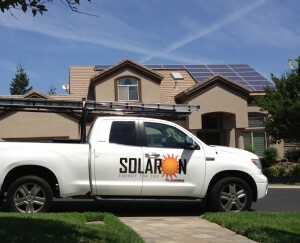 For solar panels made only by SunPower, come to Solaron. We design installations to fit any property and that work inside your budget. Why heat thousands of gallons of water with carbon-emitting natural gas when you might easily take advantage of the renewable energy of sunlight? Solaron sells Heliocoil pool heating installations for reliable temperature gains throughout the cooler months of spring and fall.